EXHIBITION | What is Life? 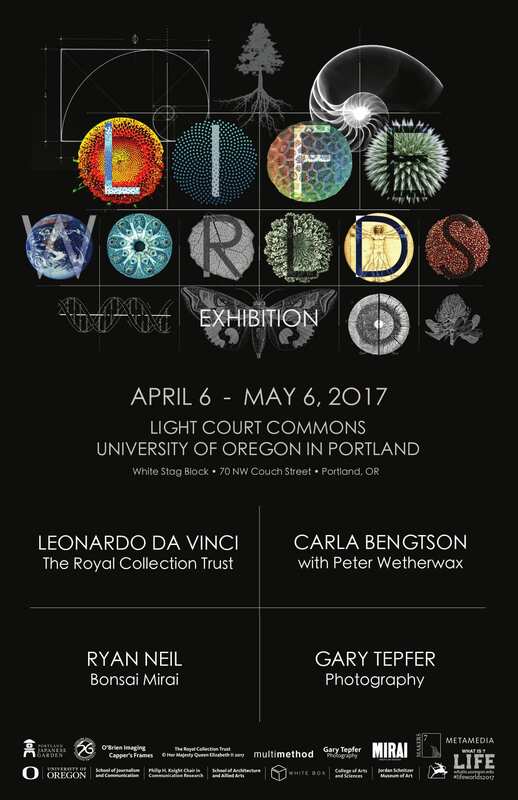 LIFEWORLDS features art-science works across anatomical, botanical, and hydological prints, multisensory installation art, as well as the juxtaposition of biological (bonsai) and representational (photography) works. Karen Lawson (Picture Library Manager, Royal Collection Trust), Peter Wetherwax (UO Biology), Chelsea Neil (Bonsai Mirai and The Artisans Cup Retrospective), Brook Muller (Director, Portland Architecture Program), Kate Wagle (Admin Director, A&AA Portland), Jill Hartz and Kurt Neugebauer (Jordan Schnitzer Museum of Art), Bruce Guenther (Former Chief Curator, Portland Art Museum), Cris Moss (White Box Gallery, Director), Brian Gillis (Made in Oregon, Organizer), Janet Wasko (UO Communication Research), John Woelfle (UO Portland Facility Services Manager), Doug Blandy (UO Center for Community Arts and Cultural Policy/Arts & Administration), John Leahy (UO Portland Fabrication Laboratory), Jeremiah Chavez (DJ), and Wade Larsen (multimethod).